Explore Raja Ampat, a group of the most beautiful islands on the planet, in Indonesia's West Papua Province. Travel one of the world's best-kept secrets offering spectacular snorkeling and diving, pristine beaches and feeling of paradise. Discover what to see and do in our Raja Ampat guide. Raja Ampat is a remote archipelago comprising of over 1500 islands in Indonesia's province of West Papua, and we dare to say it remains one of the world's last destinations protected from mass tourism, but its popularity is increasing every year and the rumors about pristine beaches, unique marine biodiversity, postcard-like landscape, and friendly Papuans, are spreading quickly. 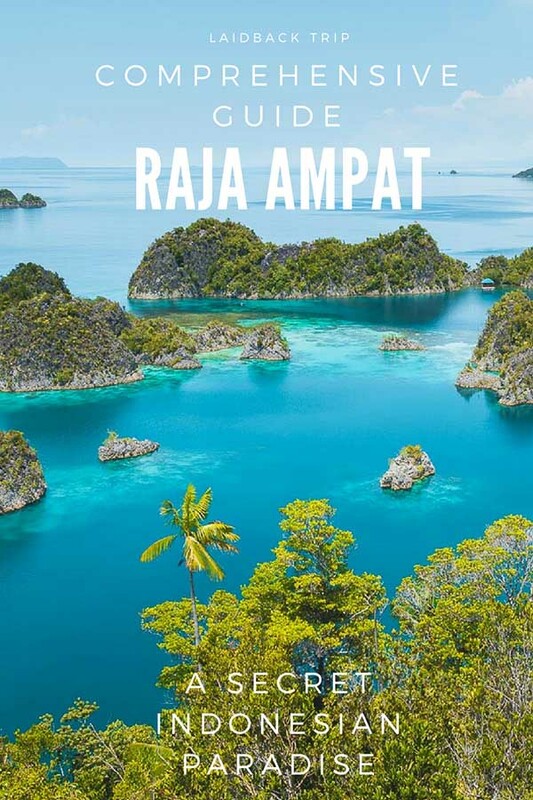 Raja Ampat is the least developed and also easternmost islands of Indonesia and the distance and remoteness determines both the life of locals and the form of tourism. The advantage and concurrently disadvantage for those visiting the area is already mentioned remoteness and time-consuming journey, but on the other hand, this is what saves Raja Ampat from the crowds and ensures that Raja Ampat will be visited only by those genuinely interested in its natural beauty. We've put together a list of best things you can see and do in Raja Ampat. Unsurprisingly, the vast majority of activities takes place in the water or in its close proximity. Raja Ampat's underwater life is fantastic and hard to compete with especially when Indonesian waters surrounding these islands are known as the most biodiverse on the planet. Simply put, the best diving and snorkeling awaits here for you. The numbers are also incredible: 1,508 fish species, 537 coral species, and 699 mollusk species altogether with mantas, orcas, dolphins, turtles and many more create real underwater heaven. Most homestays in Raja Ampat have perfect snorkeling spots right at the door, and once you explore the nearest places, hosts are willing to sail you to other unexplored underwater gems which only locals know, and you won't find them in any guidebook. Some homestays offer snorkeling gear to rent, but of course, it's best to take your own to ensure it fits. Sunsets on Raja Ampat's islands are a chapter on its own. We've never seen so many breathtaking sunsets at one place in our lives. Every evening we couldn't wait to walk on the beach, sit on the sand and enjoy the movie. If you're looking for a place to capture the most picturesque sunsets, Raja Ampat is worth it for sure. We believe the same is true of sunrises, but we were every day so exhausted after the all-day spent in the water, that we were not early-birds this time. This view will never pall and prepare that it will leave you speechless for a while. Arrive by boat or paddle a canoe to the small pier and climb few (hundreds) wooden stairs. We guarantee you won't want to leave. We spent quite a long time on the viewing platform and had to return repeatedly the other days. From the top, you can see an iconic karst island seascape. The mushroom-shaped rocks are towering from the water which is almost unnaturally blue and crystal clear, we could've even seen a turtle swimming in the sea from the viewing point. If you are craving for more views similar to Piaynemo, you can consider visiting Wayag, but it is far, and the transport is pricey. A big plus when it comes to the decision which island to visit is that you don't have to stick with one island only, but you can freely travel around and enjoy different snorkeling/diving locations, stay in several homestays and explore remote beaches in the Raja Ampat area. For inspiration, we visited Friwen, Kri, Piaynemo, and Arborek in two weeks' time. These islands are not that far away from each other and thanks to that we didn't have to spend that much time with transfers and could've enjoyed island's activities instead. What we enjoyed the most was our accommodation in homestays, and the interaction between hosts and visitors which illustrated the relaxed atmosphere in the true sense of the term. We could see our hosts' everyday life and eat food their families prepared (and caught) that day. Locals are friendly and seemed genuinely interested in our lives the same way we wanted to know more about theirs. Even though their English is very basic and in some cases none, we were able to communicate without a problem and had a lot of fun when translating what we wanted to say into their language. During two weeks spent in Indonesia's province of West Papua, we tried to see as many islands as we could, but on the other hand, we didn't want to rush and wanted to enjoy our vacation at the same time. Because our time was limited, we inevitably had to choose our destinations carefully, and after research, we came up with a list of most beautiful islands in Raja Ampat we definitely wanted to see. A small island with incredibly white sand, family homestays and a beach we had just for ourselves. The main highlight is Friwen Wall just opposite the island with the stunning underwater world. It takes about an hour to swim the whole length of the Wall, so if you are unsure about your swimming skills or level of fitness, tell so to the boatman to wait for you nearby, because in our case, he probably got a feeling that we're doing fine and left to wait for us at the very end (some of us were pretty exhausted when finally reached a small beach at the end of the Wall). Kri is a forested island, much bigger and more developed than Friwen. Accommodation is available on both sides of the island which is split by the hill in the middle. Jungle trekking is not possible because of lack of trails and steep terrain, so climbing the hill to get to the other side of the island is probably the only option if you're looking for different kind of activities. We found a lodge near the pier where the snorkeling was surprisingly good and diverse. There were small sharks (we've been told that when sharks are similarly big as a human, they shouldn't attack, but who knows) and poisonous stone fishes on the seabed so watch your steps. A super small strip of send and the accommodation on the pier was our base to explore the Piaynemo area and its surroundings. We enjoyed two days of canoeing, repeating visits to Piaynemo Lookout, new snorkeling locations, hidden coves and also hikes to get another superb (and not that known) views of the Raja Ampat's seascape. Because of minimal pollutions and light effects, this spot is great to watch stars and night sky. You don't need to stay in Piaynemo to enjoy the postcard-like views. You can reach it for example from Arborek in about 90 minutes boat ride. The last, tiny (you can walk around in about 30 minutes), but the most touristic island we visited has its charm and atmosphere. Arborek even has unified village (part of the Indonesian government’s tourist village program) with the main street through it, houses with blue roofs, sufficient homestay options and football playground. Arborek is near to the famed Manta Point, snorkeling and dive sites where you can swim with mantas. Locals are incredibly friendly, and little kids running around are everything but shy. Their evening dancing and singing entertainment is fun!